While many types of plastics and metals have been mentioned, contact us with your specific material requirements and applications. 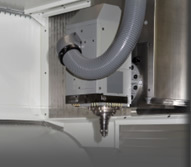 SR Machining has the capability of CNC turning of material up to 41 inches in diameter, and diameters as small as 0.250”, and can hold precision tolerances of 0.0005”. With capabilities from prototype runs to production quantities on the order of 700,000 assemblies a year, SR Machining can deliver large lots of finished CNC machined components with a high consistency and quality (with the corresponding cost savings). In addition, since we can deliver precision CNC machined parts with a high level of consistency and quality, it can result in finished CNC components going directly to a ship to stock status (bypassing quality control and inspection). Whatever your requirement or need in precision plastic or metal machining, contact SR Machining today to discuss your application.